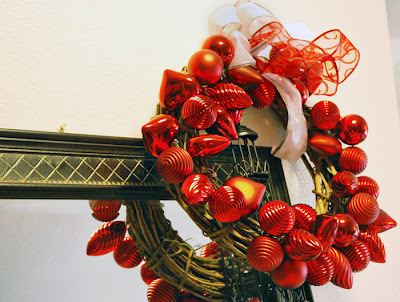 Ok, so I originally wanted to just make the full bulb wreath (without the gnarly wreath in the background. But I didn't realize how many it would take to do that. So I went to Ikea and bought one box full of bulbs for about $2.50. And when I was assembling it, I realized I didn't have enough and didn't want to drive all the way back to the store. So I got one of my "gnarled" wreaths (from DI for $1.00) and I attached wire to the beginning and then started adding about 3 bulbs. 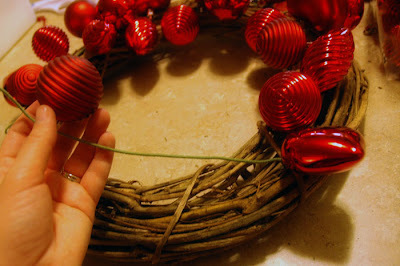 I then looped the wire through part of the wreath and added another three. Continue on and on until you're back to start. 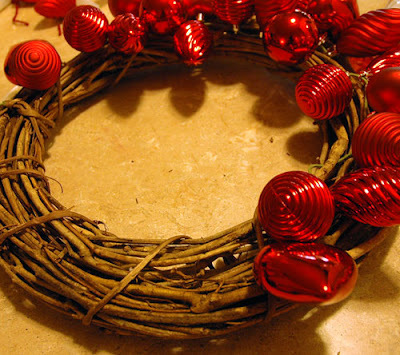 Doing it this way spreads the bulbs out so you don't need as many as a regular full bulb wreath. Then top it off with a bow. Done. And only for $3.50! woohoo!